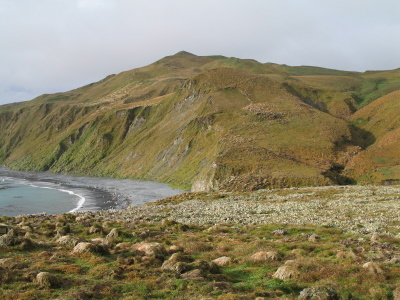 Macquarie Island is the only place on earth where rocks from the earth's mantle (6 km below the ocean floor) are being actively exposed above sea-level. This makes it an important focus of geological study. The island lies in the southwest corner of the Pacific Ocean, about half-way between Australia and Antarctica. Fauna found on the island include: Subantarctic Fur Seals, Antarctic Fur Seals, New Zealand Fur Seals and Southern Elephant Seals - over 80,000 individuals of this species. Royal Penguins breed only on this island; King Penguins, Southern Rockhopper Penguins and Gentoo penguins also breed here. Interesting geologically but not of Universal Significance. Possibility of a wider nomination possibly with NZ islands? Tectonic processes: Criterion (viii): ... The island is the exposed crest of the undersea Macquarie Ridge, raised to its present position where the Indo-Australian tectonic plate meets the Pacific plate. These unique exposures provide an exceptionally complete section of the structure and composition of both the oceanic crust and the upper mantle, and provide evidence of ‘sea-floor spreading’ and tectonic processes that have operated for hundreds of millions of years.